This single strand necklace and earring set is strung with small amber nuggets, assorted shaped stones including a small non indian made thunderbird that is carved out of turquoise and silver plated findings. 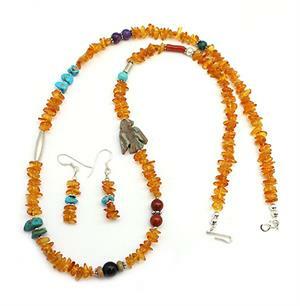 Necklace measures approximately 24" long and earrings are about 1 3/4" long including sterling french wire. Strung by Navajo artisan Naomi Garcia. Currently only this one available.